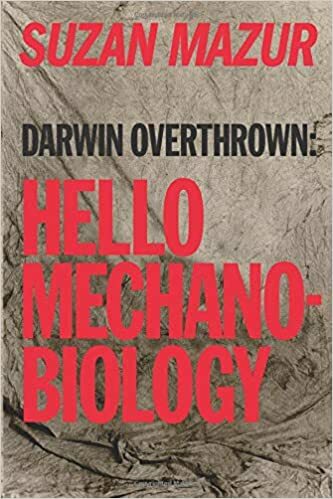 The new mechanobiology refers to “the field of science at the interface of biology and engineering that focuses on how physical forces and changes in the mechanical properties of cells and tissue contribute to development, cell differentiation, physiology, and disease”. (Wikipedia). In a series of books interviewing evolutionary biologists working to move beyond the long regnant paradigm of darwinism Mazur here shows a refreshing look at the displacement of research into the new field of mechanics and biology. The regime of natural selection mythology has gone on so long one almost stops reading books on evolution but suddenly here we see biologists moving on into new areas of study, a refreshing change, but still without the clear statement that natural selection theory is flawed, passe, falsified…It is still too controversial to point to the obvious but at least the implication is clear that biologists need to examine a far broader field of subjects. The material is a varied smorgasboard of considerations that seem to imply that the intersection of biological systems and mechanics can illuminate developmental complexity. In general the field is suddenly exploring new horizons beyond the stale realm of dull darwinism. The book opens with a section on Fodor who was one of the first mainstream scientists/philosophers to openly debunk the dogma of darwinism. But the point is not fully clear in the subsequent material. I constantly interact with students hopelessly confused by the fallacy of darwinism, but a field in transition at least leaves one to guess that that biology has moved into new fields. The book makes clear that the field is a long way from resolving key issues, such as the origin of life. As the author of World History and the Eonic Effect which shows the nature of the ‘evolution category’ between deep time and world history, I would suggest that evolutionary/developmental issues in the context of mechanics point finally to the larger field of cosmological mechanics and the mystery of life generated in the high/low media of biospheric, planetary, and astrophysical systems. Somewhere in the mystery of ‘cosmic inflation’ the imperative of planetary life emerges as a mystery of teleological ‘mechanics’. Life emerges to evolve in a high/low set of forces both low end (as here in mechanobiology) and high end at the level of stellar mechanics, a bit of a question mark, but suggested by the considerations of fine tuning in physics. One also thinks of the teleomechanists of the era of Kant, the original theorists of evolution before the braindead champions of natural selection took over the whole field and wasted a century or more in the desert of reductionist selectionism.